To close the celebration of the 200th birth anniversary of Marius Petipa, The Tokyo Ballet has chosen to premiere one of his most thrilling grand ballets, Le Corsaire. Le Corsaire is a ballet based on the poem of the nineteenth-century poet Lord Byron, set in the Mediterranean Sea controlled by the Ottoman Empire. It is a story of pirates and slave girls' exciting adventure and romance. It is packed with many celebrated passages such as powerful and virtuoso dances by pirates and beautiful slave girls, corps de ballet in Le Jardin animé and character dances. Le Corsaire in fact represents charms of Marius Petipa's grand ballets. The ballet has seen several revisions throughout its long performance history. The Tokyo Ballet will bring the version by Anna-Marie Holmes after Marius Petipa and Konstantin Sergeyev, which is included in several world-renowned ballet companies such as American Ballet Theatre, La Scala Ballet and English National Ballet. Join us on an adventurous journey with The Tokyo Ballet! *Casting as of 24 October 2018 is subject to change. Tickets go on sale on Tue. 18 December 2018, 10:00 at NBS Ticket Center. Reservations are accepted only by phone. For children between 6 and 18 years old (elementary school students --senior high school students). Up to two child-tickets per one parent ticket. Discount by \1,000 for two tickets will be on sale during the presale period (NBS WEB Ticket ) and the general sale period (NBS WEB Ticket and NBS Ticket Center). \1,000 student tickets for students between 10 and 25 years old go on sale on Fri. 18 January, 2018 at NBS WEB Ticket. You must bring identity documents with proof of age to pick up your tickets at the venue on the performance day. 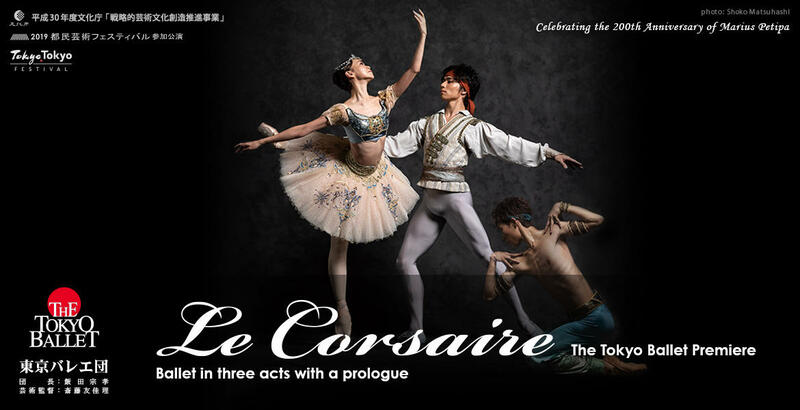 The performances of Le Corsaire will be presented as part of Tokyo Performing Arts Festival 2019, 'Tomin-Fes'. Special discount seats will be offered as 'Tomin-Fes' Seats at \2,000/seat. They will go on sale on Sat. 8 December, 2018 at NBS WEB Ticket and NBS Ticket Center.